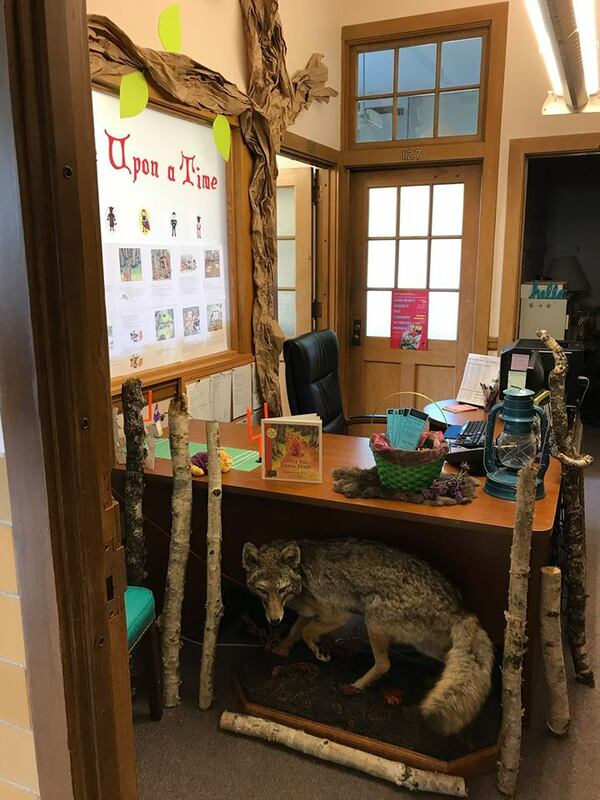 Once upon a time, every year in Fall, WIU has “Dec the Office” where faculty and staff can decorate their offices based on the yearly theme for homecoming. A panel of judges comes by contributors’ offices on the first day of Homecoming Week to take notes and eventually decide the campus winner. 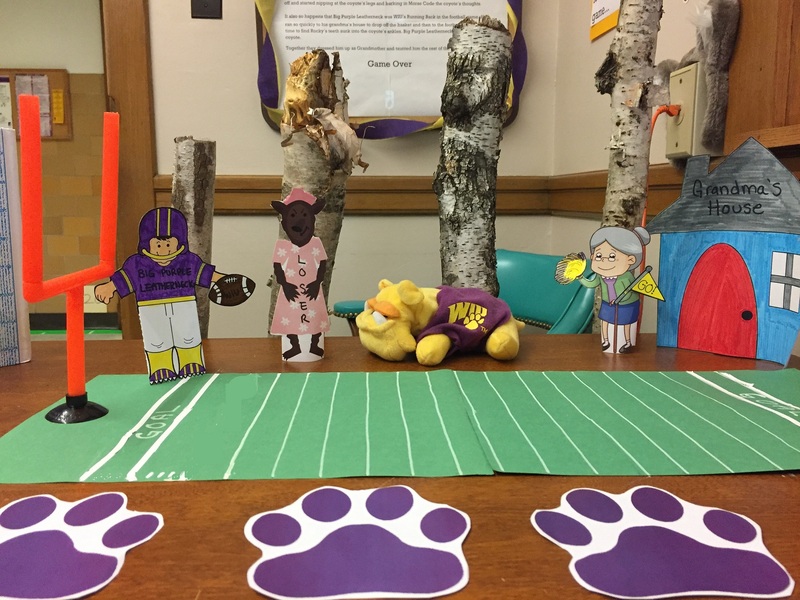 When WIU sent out an email releasing the 2017 Homecoming theme , Storybook: A Tale of Leatherneck Pride, Chief Clerk Lynne Ward overtly made her way into my office exclaiming, “We can’t be the English department and not do something for this theme!” And that moment is when it all began – our minds were turning like Rumpelstiltskin’s wheel, and we scored some gold ideas. The first thing we discovered was that English Education major Joe Turk was a fullback on the football team. 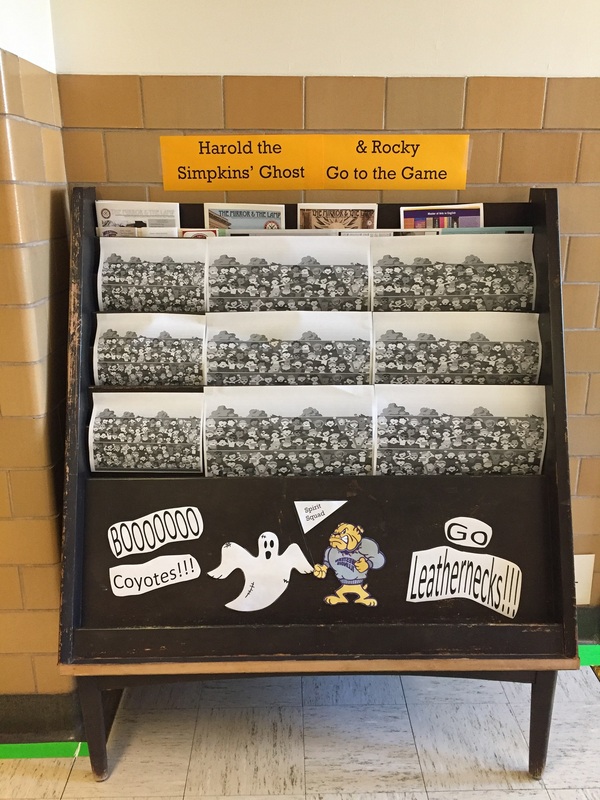 With his honored permission, Lynne created a Leatherneck Storybook Ending where Joe ran the winning touchdown against the rivals – South Dakota. 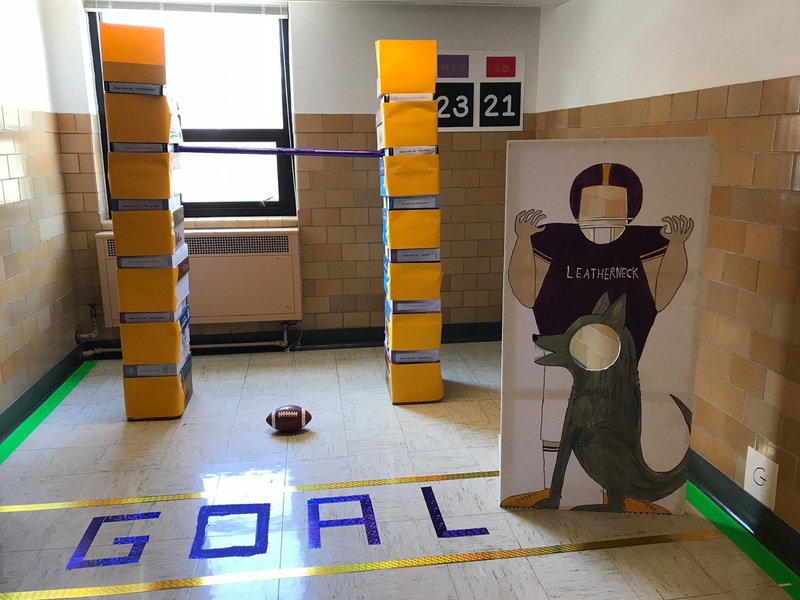 We recreated the scene with office materials including a football goal post made of fairy tale books and paper reams, plus a photo opportunity of being a WIU Leatherneck defeating the South Dakota Coyotes! Secondly, Simpkins Hall (the English department building) is haunted, if you haven’t noticed. And not many English majors are really into sports – unless picking up an anthology counts as weightlifting, tripping over things in the hall because we are immersed in books counts as being tackled, or arguing with ourselves about the meaning of life counts as wrestling. So, this homecoming theme was an interesting segue to bring that divide together. We thought it would be amiable if Rocky (WIU’s bulldog mascot) met Harold (our sly ghost) and went to the football game together for the first time – to “BARK” cheers for WIU and “BOO” the other team. They become The Spirit Squad! 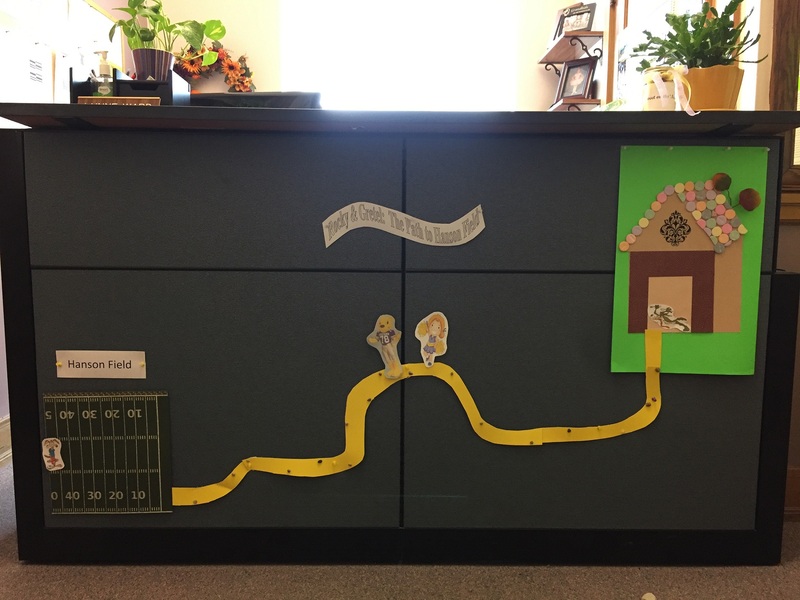 Thirdly, we each decorated our own office with a storybook theme. Lynne did Hansel and Gretel and I did Little Red Riding Hood. 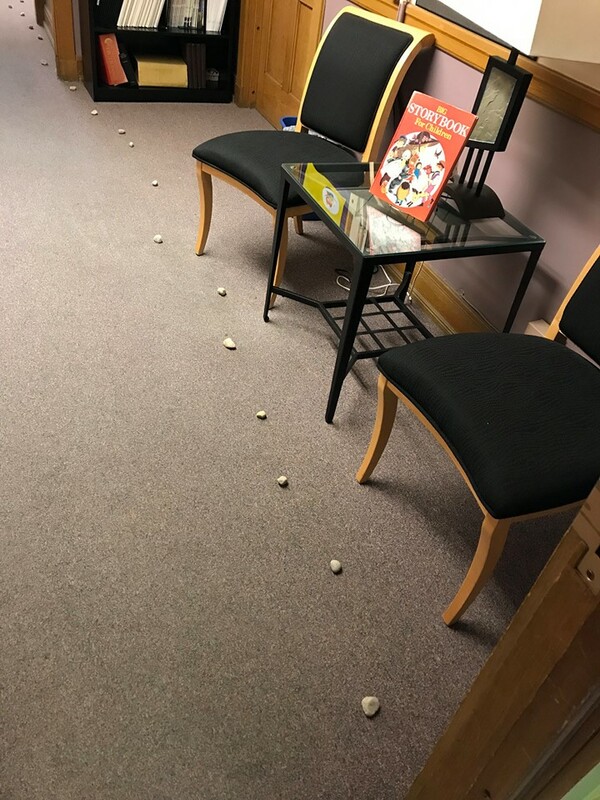 We not only highlighted the greatness of the stories, but we rewrote them into a WIU story version and decked our office as such. Lynne’s Hansel & Gretel WIU story was entitled “Rocky and Gretel: The Walk to Hanson Field.” In this story, Gretel is a football cheerleader, and she and Rocky are on their way home from practice at Hanson Field (WIU’s football field – which is spelled mighty similar to “Hansel” – I’d say this story was perfect). However, a hungry witch (well, coyote) has different plans for them! 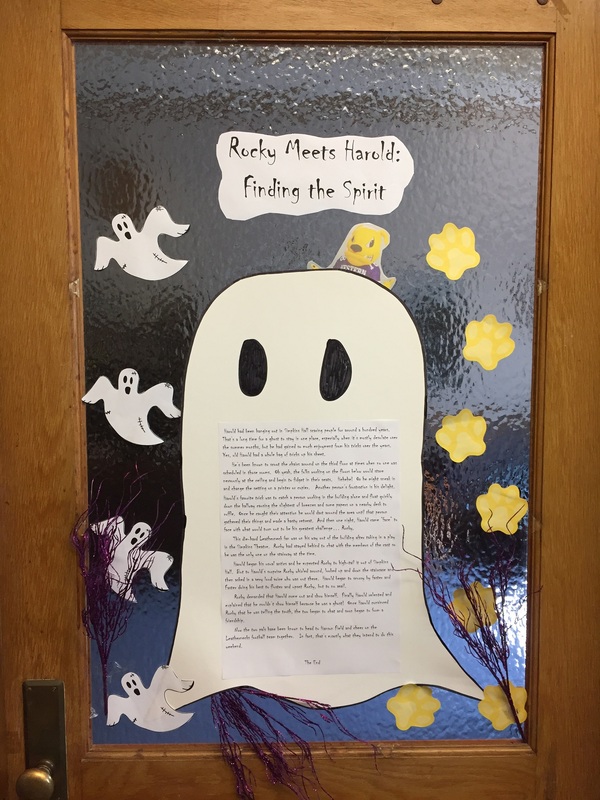 Read how Rocky and Gretel escape a deadly fate using cheerleading stunts, rocks, and an English department flashlight! 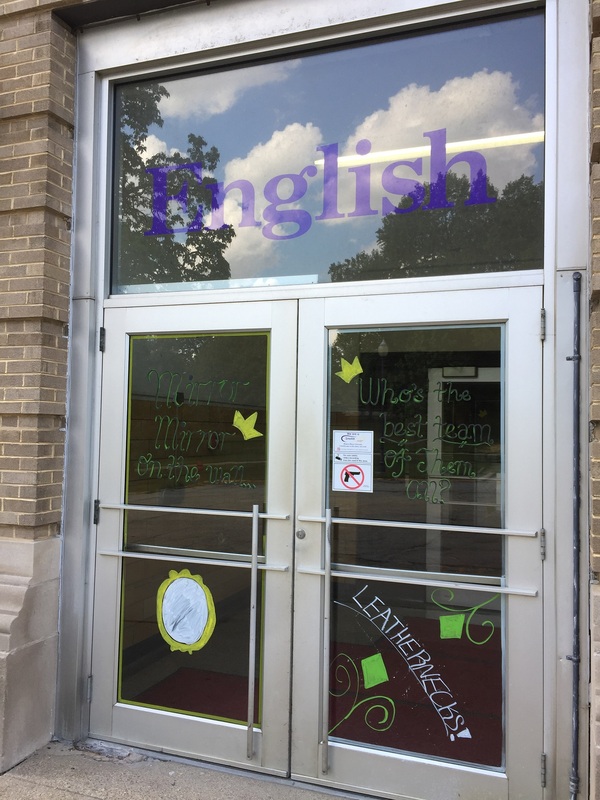 Lastly, a few of our English undergrad and graduate students painted the outside doors to Simpkins Hall to show our final design of Storybook Leatherneck Pride! Our competition was as tough as Rapunzel’s hair, but we won second place and still lived happily ever after!